In its second weekend of release, Star Wars: The Force Awakens is continuing to decimate box office records, with some speculating that it will reach $1 billion domestic sometime in 2016. The sci-fi- sequel, which is a hit with fans and critics alike, managed to pull in an estimated take of $49.3 million in the states on Christmas day. This obliterates the previous record, which was set by Guy Ritchie and Robert Downey Jr.'s Sherlock Holmes. When that franchise reboot opened back in 2009, it managed to rack in $24.6 million on December 25. The Force Awakens is currently tracking to take down the second biggest box office weekend on record. Jurassic World currently holds that title, earning $106.6 million during its second weekend of release this past summer. Star Wars 7 entered it's 8th day of release during yesterday's Holiday, and became the fastest film to reach $400 million domestically. This beat Jurassic World, which took ten days to reach that milestone. The Force Awakens is on track to hit $500 million domestically on Sunday, it's 10th day of release. Jurassic World needed 17 days to get there. Star Wars: The Force Awakens continues to be a giant hit around the rest of the world as well, taking in an overseas total of $27.5 million on Friday, which brought the global total to $76.8 million. December 25 is traditionally known as a softer market in some international territories, including the UK, where theaters are closed. Thus far, J.J. Abrams' blockbuster has earned $440.4 million in the states, along with $449.9 million overseas. The total currently rests at $890.3, but we still have two more days before the Holiday weekend comes to an end. As it stands, Star Wars: The Force Awakens is currently the #3 movie of 2015 domestically and the #5 movie of 2015 internationally. It will cross the worldwide $1 billion marker sometime this weekend. And it should have no problem taking the #1 positions globally by the time it ends its lucrative run. Star Wars: The Force Awakens helped Walt Disney Studios Motion Pictures push past the $2 billion milestone for 2015. This is the first time the studio has made it to $2 billion in a single year, adding to its already record breaking 12 month run. Disney's previous highest year was 2013, when it earned $1.719 in cumulative ticket sales. The international tallies for TFA stand as such: United Kingdom $83.0M, Germany $44.6M, France $38.8M, Australia $29.7M, Japan $25.7M, Mexico $16.9M, Spain $15.7M, Russia $15.5M, Korea $14.8M, Italy $14.2M, Brazil $12.7M, Sweden $9.5M, Poland $6.7M, Other $122.0M, Total $449.9M. The film opens in China on January 9. 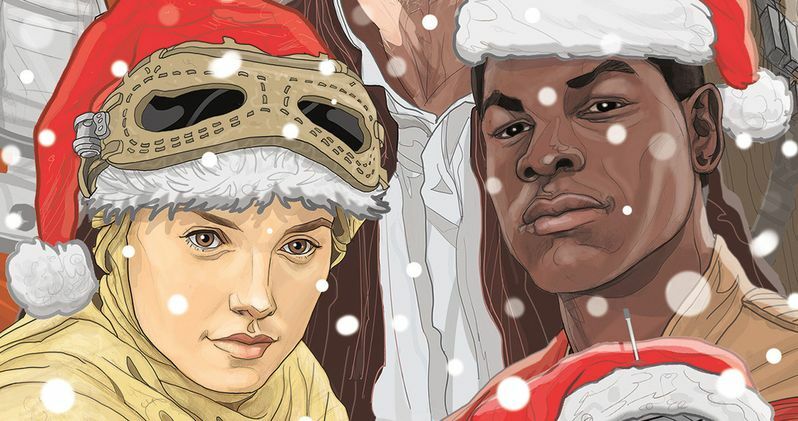 Star Wars: The Force Awakens also helped buoy the rest of the Christmas day box office, which saw several new releases into theaters. Daddy's Home, starring Will Ferrell and Mark Wahlberg, came in second place with a respectable $15.7 million playing in 3,271 theaters. Joy, starring Jennifer Lawrence, slipped into third place with $6.9 million in 2,896 theaters. The new Amy Poehler and Tina Fey comedy Sisters, which opened the same weekend as Star Wars, held onto fourth place with $4.7 million in 2,962 theaters, earning a total of $27.9 million thus far. Will Smith's NFL drama Concussion debuted in fifth place with $4.3 million from 2,841 theaters. It is expected to earn $13.3 during its first weekend run. Opening in sixth place was the Point Break remake, which earned $4.1 million. The Hateful Eight, which only opened in 100 70mm equipped theaters, managed to pull in $1.9 million. And The Revenant, starring Leonardo DiCaprio, earned $171,758 playing in just four theaters. So, what do you think? Will Star Wars: The Force Awakens be able to top out at $1 billion domestic to beat Avatar as the biggest movie of all time?